I always worry about sequels. 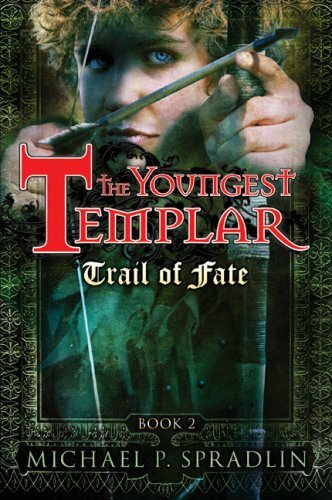 It’s especially hard when you liked the first book so much, as I did The Youngest Templar: Keeper of the Grail. What if the characters change? What if I don’t like the outcome? And the first book in Michael Spradlin’s series ended on a perilous cliffhanger–will all of my favorite characters survive? Trail of Fate is fantastic. The young squire, Tristan, is still charged with his quest of getting the Holy Grail to safety–and the way Keeper of the Grail ended left us uncertain of his fate. Luckily, Tristan, Robard, and Maryam have survived their perilous boat ride at the end of the first book and have washed up on the shores of France–much to the distaste of Robard. Even though they are much closer to home than they were previously, France provides its own set of troubles: mistrustful Cathars, oppressive French soldiers, and of course, Sir Hugh is still in hot pursuit of Tristan and the Grail. In addition to the fast paced storyline, we also get a great deal of character development. Tristan experiences his first romantic attachment to a French princess named Celia, and his internal struggle between doing his duty to Sir Thomas’ memory and getting the grail to safety as well as doing his duty as a Templar and defending the weak really tugs at the reader’s heartstrings. The blossoming relationship between Maryam and Robard is also amusing to watch–but the book strikes a good balance between portraying their relationship and not taking away from the action. Probably one of the best new characters in the book is the mother of King Richard of England, Eleanor of Aquitaine, who arrives and seemingly knows all of Tristan’s mysterious past–which perhaps explains why the King’s Guards and Richard the Lionhearted aren’t too fond of Tristan. As with the previous book in the series, there is a great deal of violence in Trail of Fate. Also,while the religious conflict in France between the Cathars and the French king is explained well enough for the context of the story, some background reading may be useful. I would check out John Farman’s Short and Bloody History of Knights–which is a fun read for anyone interested in knights. As I had feared, this book ends much as the first one does–on a cliffhanger–but I very much look forward to the conclusion of this trilogy.